Hey-o! How was your Thanksgiving? Mine was easy peasy and filling! I did zero actual cooking, all the showing up, and plenty of eating. Taking a few days to unwind and enjoy company was just what life ordered! Each year, as soon as the last person has dropped his or her fork after Thanksgiving dinner, I’m always the first person to lay claim to the turkey carcass. Why? 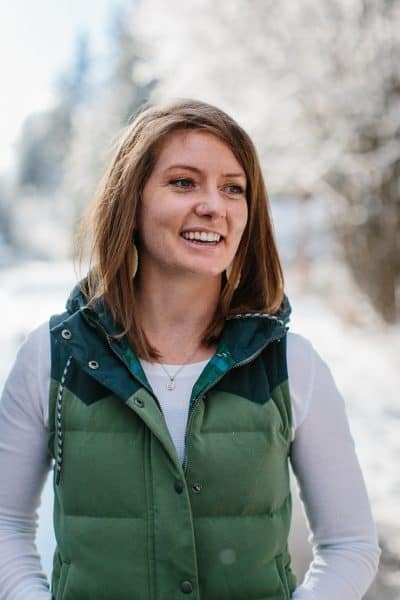 I’m full-tilt obsessed with bone broth (I drink it like it’s tea at night, and I use it for soup), and am a firm believer we should do whatever we can to make full use out of our resources. Ergo, I’m all about taking on any unwanted leftovers and turning them into something spectacular. For me, the simplest turkey soup using turkey bone broth and leftover turkey meat is the most magical of meals. 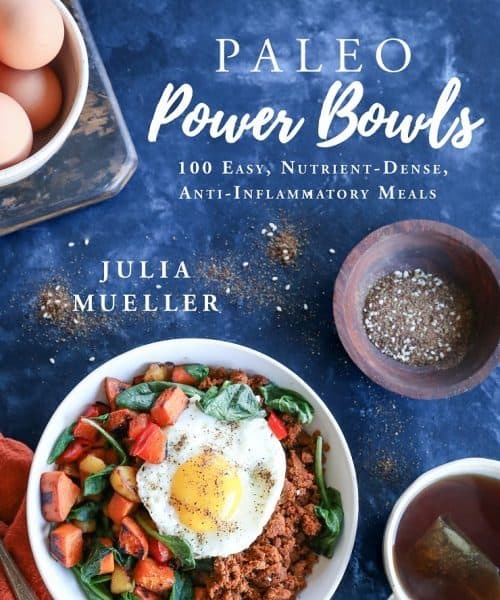 It has healing powers (bone broth is fabulous for gut health as well as a slew of other things), is ultra comforting and satisfying (the meal is easy on your tummy while packing a big protein punch), and the best part is it’s extremely easy to make. 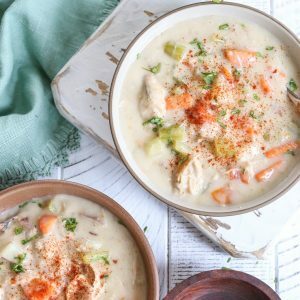 Recently, I had a hankering for super creamy soups (or chowders if you will). Think: Campbell’s Cream of Mushroom Soup…but…like…not aggressively awful for you. After I whipped up the Orange-Ginger Glazed Turkey Recipe, I made broth with the bones and used some of the leftover meat to make this chowder fantasy a reality. Wanna know how I made this recipe paleo-friendly without the use of dairy? Oh, this is going to tickle you pink. Coconut milk and tapioca flour. That’s it! 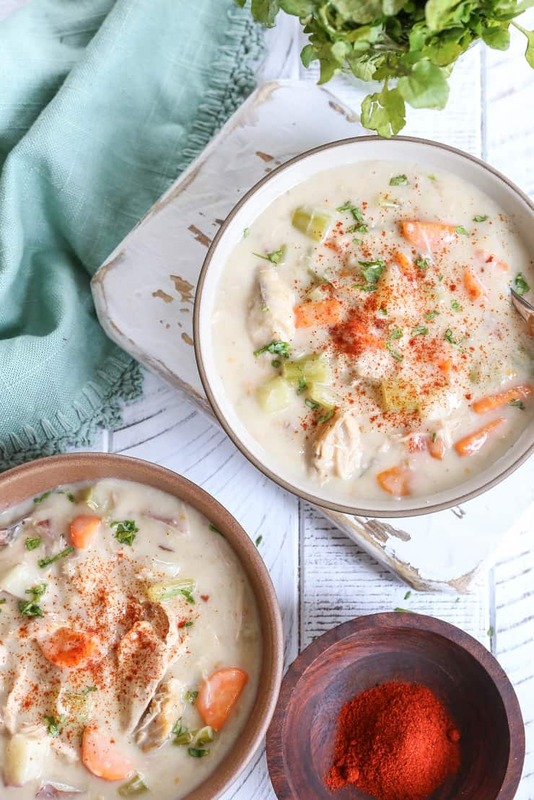 You basically make a regular turkey soup (oh hey, this can be applied to chicken soup, too), and add coconut milk and tapioca flour at the end to thicken it up and make it all nice and chowder-y. If you’re opposed to using tapioca flour for any reason at all (maybe it’s not a regular staple in your pantry), you can take a different approach using a blended up potato, exactly how I did in the Vegan Corn Chowder recipe I posted eeons ago. Consider adding any of your favorite chowder veggies, such as green beans (not technically paleo), corn (also not paleo, but delicious nonetheless), and/or mushrooms. For a little extra je ne sais quois, I added some smoked paprika to this soup, but you can also use Cajun seasoning, cayenne, or skip the spice altogether. Looking for more ideas for re-purposing your Thanksgiving leftovers? Check out my 50 Thanksgiving Leftover Recipes. Heat the oil in a large pot over medium heat. Add the potato and onion, cover, and cook, stirring occasionally, until vegetables begin to soften, about 5 minutes. Stir in the garlic, celery, and carrots and cover. Continue cooking, stirring occasionally, until all vegetables have softened but are still al dente, about 5 minutes. Add in the turkey broth, coconut milk, paprika, and sea salt. Cover, and bring to a full boil. Reduce heat to a simmer and continue cooking, covered, at least 15 minutes. Uncover the pot and add the tapioca flour and turkey. Return to a gentle boil. Continue cooking and stirring until chowder is nice and thick, about another 5 to 10 minutes. Note: For even thicker chowder, add 1 to 2 additional tablespoons of tapioca flour. 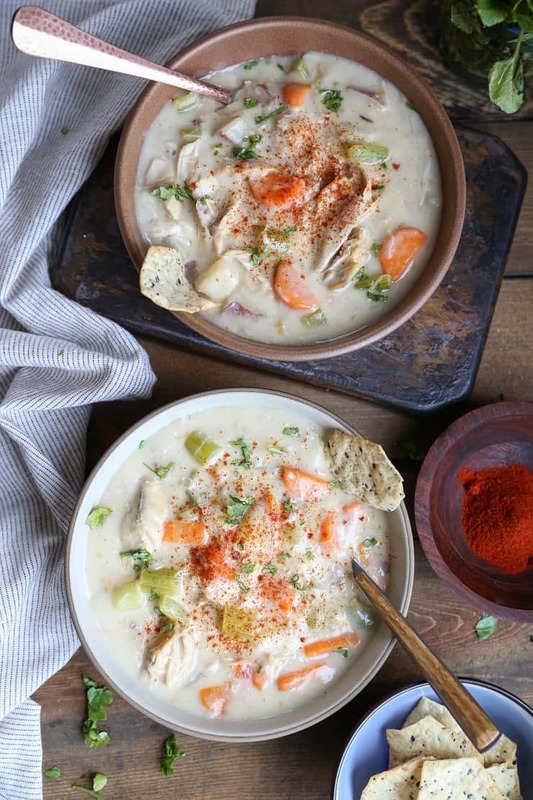 Taste chowder for flavor and add sea salt to taste. Serve and enjoy! Omit the onion and garlic to make this Low-FODMAP. *If you don't use tapioca flour in your cooking, you can replace it with a cooked potato. To do so, bake, steam, or boil a medium-sized russet or yukon gold potato, and place it in a blender along with the turkey broth and coconut milk. Blend until completely combined. Add the potato-broth mixture to the sauteed vegetables and continue as normal. You’re so lucky you didn’t have to cook, haha! I think I am forever doomed to cook so long as we eat vegetarian. Meh. Sounds like you had a wonderful Thanksgiving! I always put that turkey carcass to use too — there’s nothing like homemade turkey stock! 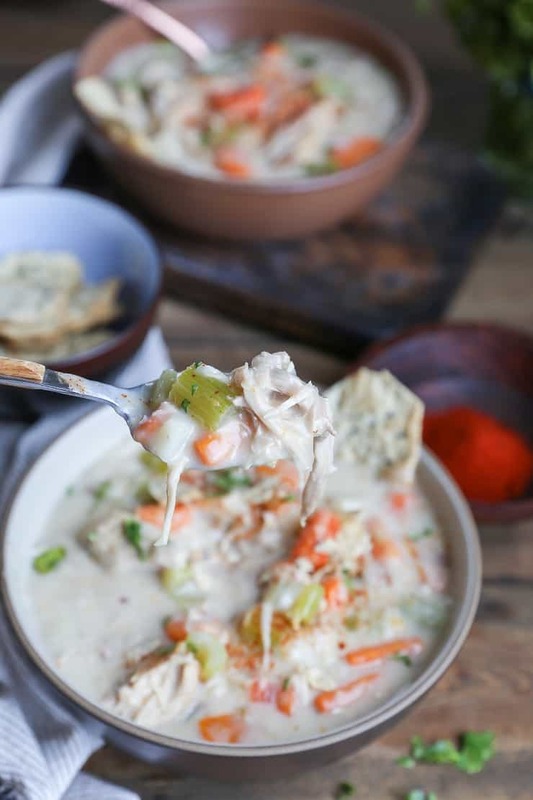 Normally I make a turkey wild rice or noodle soup but this creamy version sounds like something I need to try! THIS WAS SOOOOO GOOD!!!!!!! Thank you so much for sharing. Yaaaas! I’m so happy to hear it! Thanks for letting me know! This is a great recipe for me to make my son, who doesn’t eat lactose. He liked it a lot, and it is different than many of the soups he can eat. Thanks for a great recipe! You’re very welcome, Vivian! I’m so glad your son can eat the soup!